I love testing new things in hair care and playing with different kinds of shampoos, oils and tools. Since the summer, my go-to daily shampoo and conditioner has been the Moroccanoil Moisture Repair Shampoo and Conditioner, but I’ve been experimenting with some new items and discovered some new favorites. For a bit My hair is thick and has a slight natural wave to it and extremely prone to frizz without any product or heat treatment. My hair color is natural – it’s never been colored or highlighted (at least not yet). I like to switch shampoos up and alternate frequently – I wash my hair daily, so sometimes I feel like it needs more moisture, other times it needs a clarifying rinse. The two lines of shampoos/conditioners I used up recently are the Moroccanoil and R+Co Moon Shine. If you have any favorites/recommendations please let me know what you think I should try next! First up is the T3 PROi Professional Hair Dryer ($350, c/o). In terms of hair dryers, I’ve been a long time fan of Solano tools. In my experience they have been the best for my hair – they dry quickly, leave the hair shiny, smooth, glossy and frizz-free. I decided to give several other brands a try and nothing has given me the same results until I tried the T3 PROi. My beauty friend Rae raved about it and her hair always looks amazing everytime I see her – so I was thrilled to be able to try this. 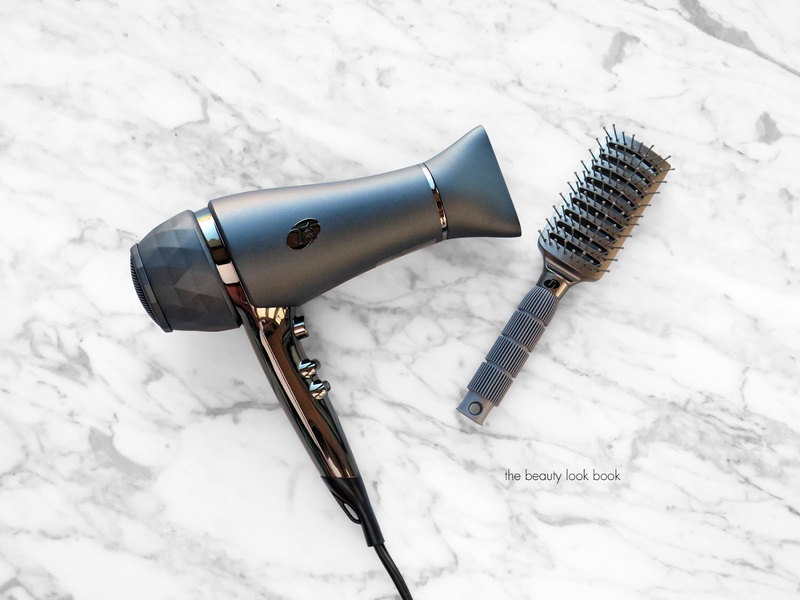 The PROi Hair Dryer comes with a mega hefty price tag but it does not disappoint. It far exceeded my expectations and allowed me to create a salon-quality results unlike anything I’ve tried before. My heart still belongs to Solano but this new one from T3 just might replace it’s spot as my new favorite. (For reference, the last one I bought was the Super Solano 3600 Ion.) The T3 PROicomes with 2 detachable nozzles, three different heat settings, a cool-shot option and two different intensities/speeds. It’s fairly lightweight for a full power full size dryer and easy to maneuver. 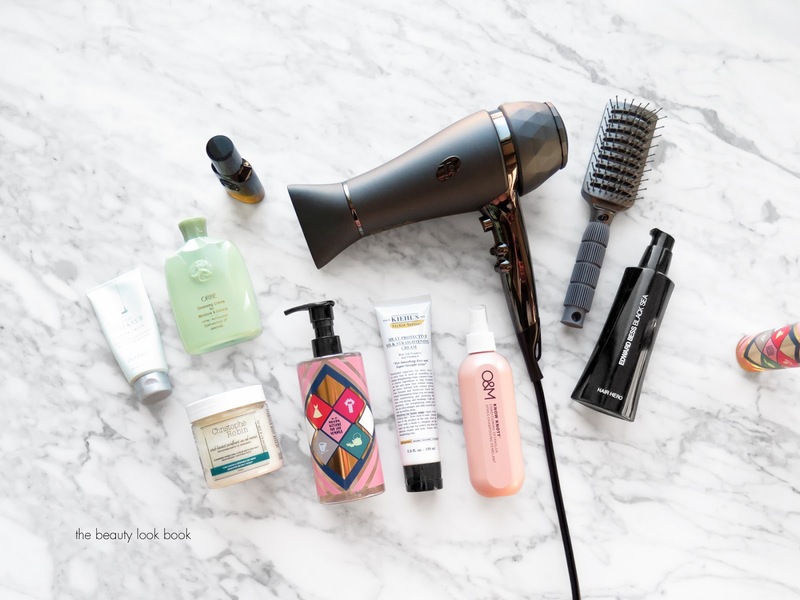 The description says it’s supposed to cut the dry time – if you blow dry with completely wet hair, it will not (but you’ll still get amazing results). If you towel dry and then spend a couple minutes doing a rough dry first, the overall time to completely dry the hair is shortened compared to other dryers. There are several different brushes that T3 launched. I decided to order the Freeflow Vent Brush ($17) first to try – it’s a good medium size brush and allows air to flow through the hair allowing for faster dry time. I like the design – it’s simple but aesthetically pleasing and seems very sturdy and well made. I’ve ordered a few more to try – I’ll do a more detailed review once I receive them. Good hair brushes are something I feel like I’m always searching for. I have good basic tools, but most of them look meh. Next are three shampoos/cleansers. 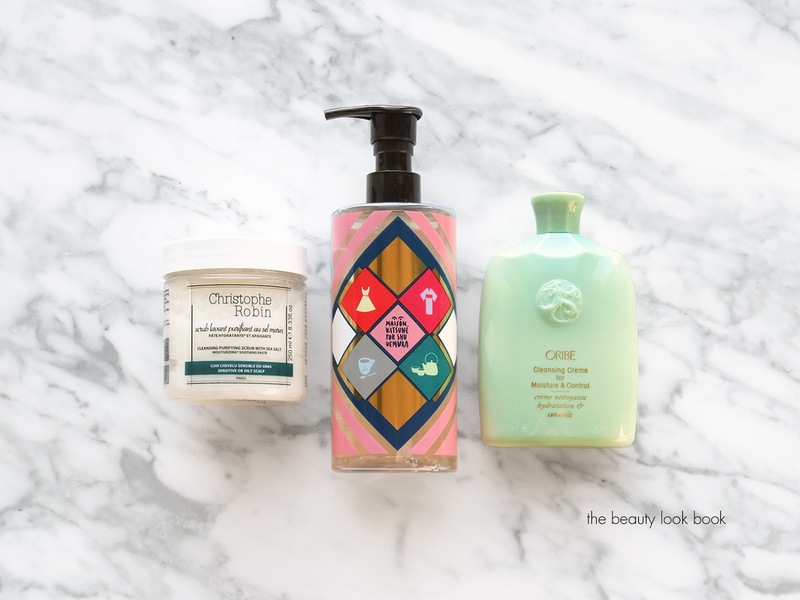 I’m a traditional liquid shampoo and conditioner kind of girl, but there are some really interesting products on the market that I would have never thought to use that surprised me. Maybe I’m late to the party, but I would have never thought to use scrubs or oils to clean the hair. Christophe Robin Cleansing Purifying Scrub with Sea Salt ($52 for 250 ml, c/o) is something that is relatively new to the US. Christophe Robin is a colorist from France and launched his own salon and line of products. Net-A-Porter sent his new Cleansing Purifying Scrub for me to try a few months ago and so when I had the opportunity to meet him in person while he was in LA, I jumped at the chance. I will have a dedicated feature on more of his products soon, but in the meantime you can read about his story here. It was so great to learn about his story and the background behind the creation of his line. The Cleansing Purifying Scrub with Sea Salt is an amazing clarifying product. It is a grained-paste product that you rub into your scalp. It rebalances the hair and rinses out completely without any residue left behind. It removes impurities and leaves the hair feeling squeaky clean. If you have normal to dry hair, you may need to follow with a moisture mask. For me this is a game changer. You can find his line at Net-A-Porter, Sephora and Saks Fifth Avenue. Shu Uemura Cleansing Oil Shampoo Gentle Radiance Cleanser x Maison Kitsune ($57 for 400 ml, c/o) has been on my radar for a while but the concept of using an oil to wash my hair just didn’t seem appealing to me. Still the Shu Uemura Cleansing Oil Shampoo has cult-status and rightfully so. There are several formulas of the Cleansing Oil, the one I tried is the Limited-Edition Maison Kitsune in the Gentle Radiance Formula. It foams up into a really nice lather and cleans the hair really well. For me this is best used as once a week a clarifying treatment (alternating with the Christophe Robin) – at most 2x per week or on days after I work out. I do think it’s absolutely necessary to follow with some kind of rinse out conditioner if you use this one as it can be stripping if you skip. Some shampoos I don’t feel the need to use conditioner after, but this one you do. Oribe Cleansing Crème for Moisture and Control ($44 for 8.5 oz/250 ml) is the most amazing cleansing creme I’ve tried. My local salon always uses some kind of cleansing creme to wash my hair before a cut but I’m particularly sensitive to scented hair products so I never end up purchasing what they use even though the results are amazing. 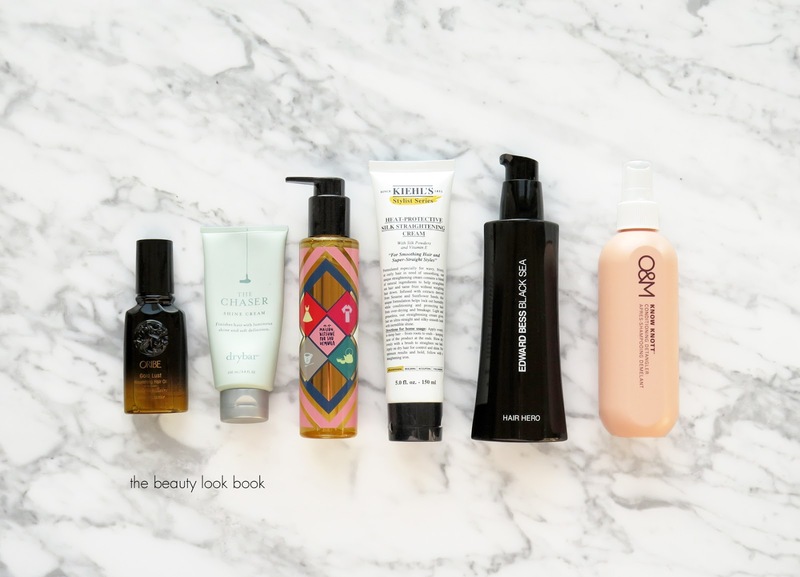 I love all things Oribe although the line is fairly spendy so I feel like I have to keep this brand at arm’s length or it can get very expensive at the rate that I go through hair products. This one moisturizes perfectly and leaves the scalp feeling well nourished but clean. Hair is perfect afterwards – tangle free, smooth and left light and bouncy with a bit of natural shine. I don’t need to search for any other cleansing cremes as I have found THE ONE with the Oribe. Last but not least are some hair treatments and finishing products. I’m always trying minis of hair oils, sprays, creams and what not. It takes me forever to use up anything because I have so much in rotation. Scent is a big deal to me. If a hair product smells too floral, too vanilla, too perfumey or strong, I simply won’t use it – no matter how good it is. Oribe Gold Lust Nourishing Hair Oil ($49 for 100 ml, also in this travel set) is one of my favorite hair finishing oils. The full size is very expensive but you only need a little bit to coat the ends of the hair so it lasts a long time. It adds the perfect amount of shine to the hair, especially when the ends start to look or feel dry. It is fairly strongly scented but I love the way everything from Oribe smells. Drybar The Chaser Shine Cream ($29 for 100 ml) this has made an appearance on my blog many times. I like it because it adds shine and also helps as a pre-heat treatment. It maintains and controls frizz and leaves the hair feeling ultra soft. My husband likes to use this one too. Shu Uemura x Maison Kitsune Essence Absolue Nourishing Protective Oil ($69 for 150 ml, c/o) smells amazing and has notes of camellia, grapefruit, white essence, musk and heliotrope. This is a multi-purpose oil. The directions say you can apply it on the hair pre-shampoo or afterwards as a leave-in product. I prefer to use it after shampoo either on slightly damp hair before I blow dry or just simply as a leave in product as my hair air dries. It’s nourishing but very lightweight and won’t weigh down the hair or make it look greasy. Hair absorbs it quickly so there’s no residue left afterwards if you touch your hair. One pump is more than enough to cover my hair (it’s a little past the shoulder length). I will definitely be repurchasing this once it is used up. Kiehl’s Heat-Protective Silk Straightening Cream ($17 for 150 ml) this is something I bought in store a while ago. I needed something as an add on to qualify for an in store promo so I decided to try this. I had used the Creme with Silk Groom when I was in college and liked it but it can be very heavy and easy to overdo. The girl at the store recommended I try this since I heat treat my hair regularly. I really like it to help straighten the hair and keep it smooth looking. I found it makes a noticeable difference in the way the hair looks in terms of helping give a more straightened look. Edward Bess Black Sea Hair Hero ($44 for c/o) is my favorite texturizing hair product. It helps add volume, smooths hair, adds texture. Full review in this post here. The bottle is huge and even with regular use it’s lasted me for like forever. Original and Mineral Know Knott Detangling Spray ($26 for 250 ml) is the best detangling product I’ve tried. Some days my hair just feels extra tangled and there are knots in my hair even after shampoo + conditioner. A few sprays of this one makes any comb or brush glide through the hair easily without any tugging or pulling. I tried this at my salon in a mini first and loved it so much I bought the full size. That wraps it up for new hair discoveries along with favorites I consider staples. Have you tried anything from any of these lines before? If yes please let me know what you recommend. If not, I’m open to other suggestions on what you’ve tried and love 🙂 Do you have any hair products you consider game changers? I’m in the market for a new liquid shampoo and conditioner – what should I try next? Some items featured indicated with a “c/o” beside the product name were sent free of charge for review consideration. Other items purchased by me.